Though jokingly given the name "Steve," Minecraft's lead character is supposed to be gender neutral, said the game's creator. All living things in the game are supposed to be gender neutral, in fact. Markus "Notch" Persson, musing about gender in the low-resolution world he created two years ago, admits that calling the protagonist "Minecraft Guy" for lack of a better term, and then "Steve," in humorous response to a question, definitely pegs the character as a male. But that wasn't his original intent. "The human model is intended to represent a Human Being," Notch wrote today. "Not a male Human Being or a female Human Being, but simply a Human Being. The blocky shape gives it a bit of a traditional masculine look, but adding a separate female mesh would just make it worse by having one specific model for female Human Beings and male ones. That would force players to make a decisions about gender in a game where gender doesn't even exist." Going further, Notch explains that all other living things in the game are genderless, if not exhibiting the traits of both genders. "The chicken/duck/whatevers have heads that look like roosters, but still lay eggs," he says. Cows have both horns and udders (though he notes there are some breeds in which female cows have horns). 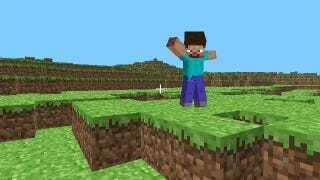 Notch acknowledges that Minecraft can take this middle-of-the-road approach because of its deliberate, pixelated artistic style. "The better your graphics are, and because of how quickly the human mind tries to identify the gender of other humans, you are going to have to make a decision as a developer about gender," Notch said. He didn't want to force players to make decisions about gender in a game where that didn't even exist. Thus, as there is only one gender to choose from, "every character and animal in Minecraft is homosexual," Notch said. "Take THAT, homophobes!"